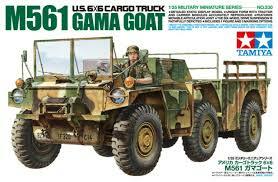 The M561 Gama Goat was seven years in development until production of the vehicle began in 1968. Its unique name was derived from the creator of its articulated joint, Roger Gamaunt, and its mountain goat-like climbing ability. Kit features optional front windshield and front-mounted winch parts, 6-wheel drive suspension and 1 driver figure. Decals and markings for (3) vehicles.